Ísafjörður (pronounced [ˈiːsaˌfjœrðʏr̥], meaning ice fjord or fjord of ice, ice in plural genitive) is a town in the northwest of Iceland. The oldest part of Ísafjörður with the town centre is located on a spit of sand, or eyri, in Skutulsfjörður, a fjord which meets the waters of the larger fjord Ísafjarðardjúp. With a population of about 2,600, Ísafjörður is the largest settlement in the peninsula of Vestfirðir (Westfjords) and the administration centre of the Ísafjarðarbær municipality, which includes – besides Ísafjörður – the nearby villages of Hnífsdalur, Flateyri, Suðureyri, and Þingeyri. According to the Landnámabók (the book of settlement), Skutulsfjördur was first settled by Helgi Magri Hrólfsson in the 9th century. In the 16th century, the town grew as it became a trading post for foreign merchants. Witch trials were common around the same time throughout the Westfjords, and many people were banished to the nearby peninsula of Hornstrandir, now a national nature reserve. The town of Ísafjörður was granted municipal status in 1786. The former Danish trading post Neðstikaupstaður, established in the 18th century, contains the oldest collection of timber frame houses in Iceland. These include Krambúð (1757), Faktorshús (1765), Tjöruhúsið (1781), and the site of the Westfjords Heritage Museum Turnhúsið (1784). The Westfjords are known to be the coolest area in Iceland at sea level. Ísafjörður has a tundra climate (ETf) closely bordering on a subarctic climate (Dfc). The climate characterized by cold winters and cool summers. The warmest month is July with the mean temperature of 9.9 °C (49.8 °F); the wettest is November with 120 mm (4.7 in) of precipitation. The climate has significantly warmed in recent years. As the rest of Iceland, Ísafjörður experiences high winds and very few clear days throughout all the year. The town is connected by road and a 5.4 kilometres (3.4 miles) road tunnel to Bolungarvík which lies 15 km (9 mi) to the northwest, and to the village of Súðavík to the east. The partly one-lane Vestfjarðagöng (Vestfirðir Tunnel), completed in 1996, leads to the towns of Flateyri and Suðureyri, and to the western parts of the Westfjords. Ísafjörður has an airport with regular flights to Reykjavík. Fishing has been the main industry in Ísafjörður, and the town has one of the largest fisheries in Iceland. A severe decline in the fishing industry for a variety of reasons, such as fishing restrictions in the early 1980s, and a decline in the fish population, has led the inhabitants to seek work elsewhere, leading to a decline in the town's population. The harbor also serves ferries to nearby settlements as well as larger cruise ships for tourists visiting the area. The tourist industry is growing; it is a major access point to the nature reserve on the Hornstrandir Peninsula, an uninhabited wilderness area to which ferries run weekly during summer. Despite its size, small population, and historical isolation from the rest of the country, the town has a relatively urban atmosphere. Ísafjörður has a school of music, as well as a hospital. The older former hospital building now accommodates a cultural center with a library and showrooms. Recently, the small town has become known in the country as a center for alternative music outside of Iceland. A yearly festival, Aldrei fór ég suður, provides a platform for local musicians and bands from around Iceland and even from overseas. A university center, Háskólasetur Vestfjarða, which acts as a distance learning center for the 7000 residents of the Westfjords, was established in March 2005. Ísafjörður is the home to the University Centre of the Westfjords. The University Centre offers two master's degree programs. One in Coastal & Marine Management and the other in Marine Innovation. Students graduate from the University of Akureyri. In Ísafjörður is the only FE college of the Westfjords, Menntaskólinn á Ísafirði. The students range from 16 to 20 years of age, as is traditional in Icelandic colleges. 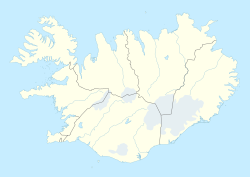 Major employers in the region include Hraðfrystihúsið-Gunnvör, 3X technology, Klofningur, and Íslandssaga. Ísafjörður is also the base of several noteworthy start-up companies including Fossadalur and Kerecis. In 2002, Ísafjörður's own Mugison (a.k.a. Örn Elías Guðmundsson) and his father organized the first Aldrei fór ég suður Music Festival as a free concert to support the burgeoning music community in Ísafjörður. The event has been established as an annual festival in mid April. The name Aldrei fór ég suður (I never went south) is taken from a Bubbi Morthens song of the same name, and may refer to a movement among young Icelanders to establish cultural events outside Reykjavík, and draw attention back to the nation's roots in the countryside. The festival's subtitle is "rokkhátið alþýðunnar" or "rock festival for the people." Since 2001, the Við Djúpið Music Festival has offered master classes and concerts with nationwide and worldwide known artists, such as Erling Blöndal Bengtsson, cellist and Vovka Ashkenazy, pianist as well as the Pacifica Quartet, Evan Ziporyn, clarinetist, composer, and a member of the band Bang on a Can gave a master class and concert in Ísafjörður during Við Djúpið 2007 and among performers at the 2008 festival where Pekka Kuusisto, violinist with Simon Crawford-Phillips, pianist and Håkon Austbø, pianist. ^ "Neðstikaupstaður-Krambúðin". Byggðasafn Vestfjarða. Retrieved May 20, 2018. ^ "Neðstikaupstaður-Faktorshúsið". Byggðasafn Vestfjarða. Retrieved May 20, 2018. ^ "Neðstikaupstaður-Tjöruhúsið". Byggðasafn Vestfjarða. Retrieved May 20, 2018. ^ "Neðstikaupstaður-Turnhúsið". Byggðasafn Vestfjarða. Retrieved May 20, 2018. ^ "Monthly Temperature and Precipitation Averages for Þórustaðir". Icelandic Meteorological Office. Retrieved 19 March 2017. Wikimedia Commons has media related to Ísafjörður. Wikivoyage has a travel guide for Ísafjörður. This page was last edited on 16 March 2019, at 05:43 (UTC).